Today I thought it was the right time to switch things up a bit. My thinking right now is to call my blog and newsletter “Taking Your Time.” I have been focusing on homesteading but I realized that this wasn’t the real point for me. I do things slowly. I take my time with things in order to get the most out of something. This could be a fun journey that can be shared with photos, projects and interviews with like minded folks. I feel that we can learn so much from others with their own passions and this would be an amazing place to collect these. A higher quality product is created. I started sewing by constructing garments. 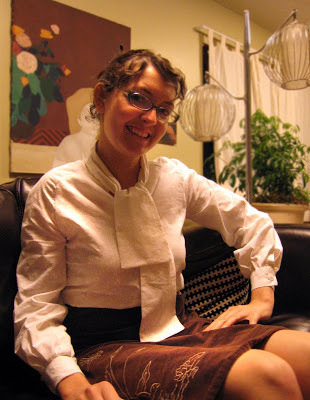 This was my first shirt that I sewed seven years ago (I had no idea how to do it but I have learned that you need to at least try something first before you can learn anything). I was instantly hooked on sewing and learned how long something actually takes to construct. With each project I have learned how to fit, work with different materials, construction techniques, pattern use, etc. The jacket photo to the right shows one of my more recent projects sewing with silk, multiple zippers, linings, fitting, etc. 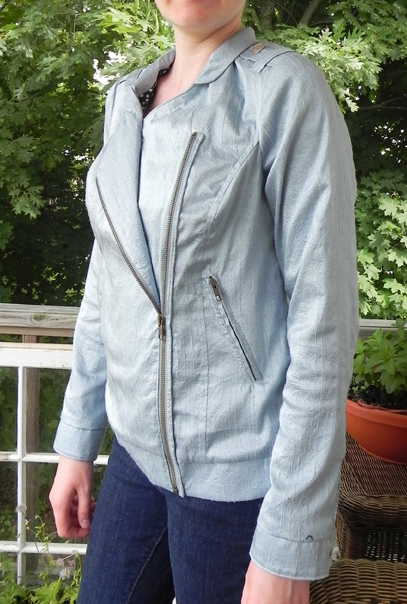 This jacket was lovingly and carefully constructed and I love wearing it! It is the best feeling in the world when someone compliments you on it and you get to say that you made it! The look of surprise makes all of it worth doing! 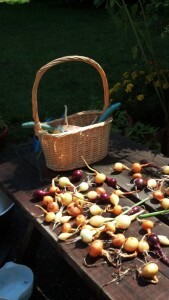 One of the reasons that I like to grow my own food is that I know the history behind the item. I grow organically and know that when I am eating the food it wasn’t laden with chemicals. I don’t eat a strictly organic diet (I would love to but financially it isn’t an easy option), but I try to make an effort to when I can. When cooking it is also good to know all of the items that go into something that I am eating. The fast route these days is to buy something that can be stored easily and microwaved quickly. There is something lost in the building of flavors, timing and inspiration for these meals. That being said it can take a lot of energy to accomplish these meals. I want to start collecting quick tips for this and sharing these on the blog. In many ways technology brings a lot into our lives. It offers information quickly to those who may not have been able to access it. It also makes it so that our brains don’t retain as much needed information. Do you notice that you always misspell the same word? Our computers will automatically change our misspellings and we move on. We get so used to having things come so quickly that we expect everything to follow. We can order something online in minutes and it is delivered the next day. In some ways it is hard for our brains to imagine the length of time that actually goes into learning, building or creating something. It takes an effort to really let go and allow something to develop over time. I want to focus on the reverse of this and focus on classic forms of entertainment and creating. I am a slow walker. It is actually really weird. My sister joked with me recently that I walk like I am a lady on Downton Abbey. It is more of a casual stroll than a brisk “I-need-to-get-there” motion. To me, I am able to pace myself with my day and take in all that I need to. One of the things about having a dog is that you leave the house a few times a day and go for a stroll. It is a great way to get some air in your lungs, some sun on your face and change up what you are doing. Taking a slow stroll is a great way to reset your day. I am also in the works with setting up weekly challenges and themes to follow along with. I miss that part of creating work for a show. I am going to use my blog as a platform for this. Do you have anything that you like to take your time with?